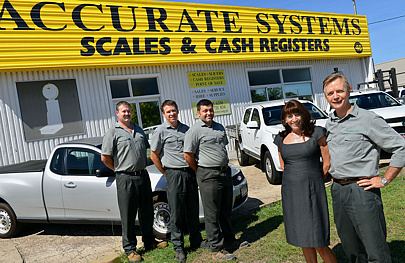 Accurate Systems boasts an industry envied track record of providing only the best cash registers and point of sale equipment, along with the sales and legal servicing of scales, weighbridges and load cell technologies. The best equipment comes with the best service, maintenance and repairs covering the Townsville area. We have a solid knowledge of the Townsville cash register and scales industry and work with clients in the area and endorsing a pro-active rather than a re-active scope to our systems. Our services and workmanship will exceed every client’s expectations. When you need to accurately record all your financial transactions you must be able to rely on the quality machines available through the expertise of Accurate Systems and their professional team. At Accurate Systems we only sell and legally service/maintain the world's best brands of scales from medical and currency scales to counting, retail and even hanging crane scales. At Accurate Systems we work with all major companies and governmental departments in the provisioning, maintainence, service and supply of weighbridge parts. Accurate Systems can supply and provide full back up service on most brands of belt weighers. We can provide a regular maintenance schedule to keep your belt weigher accurate and reliable. Our quality assurance program is fully licensed to provide a legal testing and reporting regime enabling the quality service that we provide to exceed your expectations in all instances!